Thanks for all the great entries in the Winter Wonderland contest! Today marks the end of the entry period. Our judges are hard at work choosing a winner from all these...well..."cool" stories! We have a new utility for The Sims which lets you choose new skin and clothes for your Sims from all the ones you've installed or downloaded. Get it today! With the blare of the trumpets and singing of the angels, the Holiday building contest has ended and the winners have been chosen! We would like to thank all of you who entered. The entries were many and varied, and the winners all showed their talent and creativity. We've got a tasty new download for you this SimDay. Get these yummy holiday cookies for your Sims, and see who drops by for a nibble! When the holidays roll around, everyone reaches for the treats. These tasty cookies are just the thing to please your special guests! Old Teapot Ride Now a Landmark! Everyone mourned the closing of Llama Land amusement park, but thanks to funds from the SC Preservation Society, the old Teapot Rides have been lovingly converted to historical monuments! Dismantled due to anti-scald legislation, these rides sat derelict for a generation. Now they live again! Sims love them for memories of yesteryear. Tourists love them for their quirky charm. Restoration by Ocean Quigley and Associates. The deadline for the Holiday Building contest has arrived. All contest entries needed to arrive by 11:59 p.m. PST, December 18, 2000. The contest judging will take place here at Maxis and winners will be announced in the contest winners space on or about December 22. Good luck and thank you to all who entered. And, to those who did not enter, Bah-humbug. The good news is that by the end of the week you will have gotten two landmarks from Maxis this month. The bad news is you do not have them yet. But, the collection this week is a special gift from the SimCity art director. Check back later this week for a specially crafted gift from Mr. Ocean Quigley. 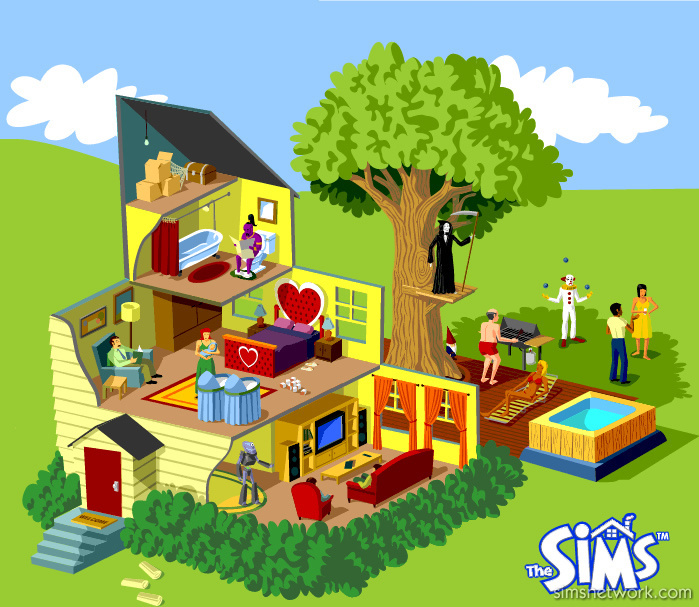 The Art Director for The Sims comes to the chat room at 4pm PST today! Charles London and his team created the look and personality of the game we all love. Get the behind-the-scenes scoop! Alhambra de Granada is the most important work of art dating from the last Islamic sultanate in the Iberian Peninsula. The Nasrid Dynasty (1238-1492), who was responsible for building the Palace, would be proud to see this this structure in a SimCity urban landscape. Well, we will have to assume they would be proud. In any event, this magnificent structure will look great in any city. Have fun plopping it in yours. Come on over to the Sims Funhouse! We've got funny videos, web cams and silly games for you!